Found 3 file extension associations related to Family Lawyer and 3 file formats developed specifically for use with Family Lawyer. Use Family Lawyer to assist in completing legal documents yourself, preparing your will, managing your estate and much more, without spending time and money to have a lawyer fill them out for you. Simply enter your information in the question-answer format to produce accurate and reliable documents to handle legal issues. EXPANDED! Find almost any up-to-date legal form or letter you need – more than 270 templates in dozens of useful categories are included. NEW! Navigate the program faster with an easy-to-use user interface! NEW! Save time with “smart” data — you'll never need to re-enter information! NEW! Use the personal document wizard to locate the appropriate forms for your needs. Keep current with 12 full months of automatic online updates. Familiarize yourself with legal terms and phrases with The Plain-Language Law Dictionary, included! Track and plan for major purchases, loans and other financial decisions with Interest Vision™ financial calculator. Rely on password protection and secure encryption technology to ensure your confidential legal documents don’t fall into the wrong hands. * For USA use only. Why spend the extra time and money to have someone else handle your basic legal matters? Family Lawyer® makes it easy to protect your family and finances! 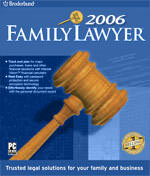 The Family Lawyer software seems to be old or discontinued. If you need more information please contact the developers of Family Lawyer (Brøderbund Software, Inc.), or check out their product website.